We are proud to announce a brand-new, complete update to Cultural Detective India. As you know, we update our Cultural Detective packages a few times a year, in minor ways, as things happen around the world. Values seem to be the slowest things to change. Societal shifts take time and then, once they happen, boom! Big changes are afoot. We have a best-selling India package in our series, one that gets rave reviews, and we have been looking a long time for fresh eyes and new energy to update Professor Madhukar Shukla‘s terrific work. I am pleased as punch to report to you that two incredibly talented interculturalists have added to the greatness of this package: Shilpa Subramaniam and Melanie Martinelli. Read on for a bit of back story on this wonderful new version. When we first discussed updating the Cultural Detective India package, we realised that we were both very drawn to the work. Being interculturalists, avid travellers and facilitators of intercultural sessions, we both felt that we could bring a different flavour to the package. Our biggest challenge was collaborating, as our travel schedules and calendars didn’t really put us in the same geography! So it might not come as a surprise that our first brainstorming session was in a car when we were travelling out of the city (Bangalore in this case) to co-facilitate a session. 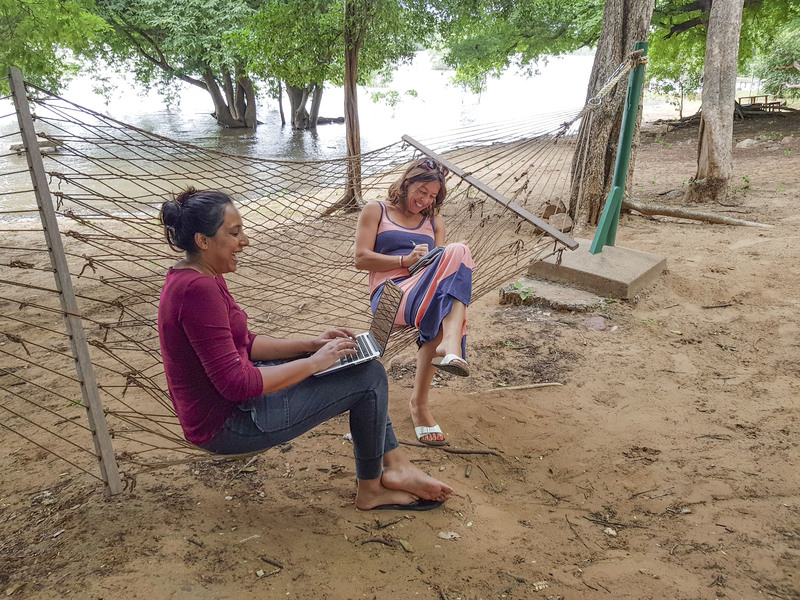 The picture above is the two of us sitting next to the river Cauvery and brainstorming our way through the package! What was so interesting about that conversation was that both of us have such different perspectives: Melanie is a Swiss national who has lived and worked in India for more than a decade and is married to an Indian; Shilpa is Indian born, was brought up all over the country and has lived and worked outside of it. And yet, we found powerful experiences and threads that we had in common when living/ working / experiencing this wonderfully diverse country. Cultural Detective strives to have authors work in teams on packages, to have this insider-outsider joint perspective, and we quickly learned why that is invaluable. We had quite a few “breakthroughs” during the process of brainstorming and writing the CD India package, but perhaps the most interesting one was when we tested out the idea of “privilege” being one of the core Indian values. In India, privilege isn’t just hierarchy and status, it is this clear-cut idea that if you belong to a certain social strata, then there are certain privileges that are ascribed to you, and these privileges differ across strata, class and religion. Yet the word “privilege” could have such negative connotations to some that it might not fit the golden rule of core country values—no value is positive or negative, they are neutral because they can be perceived both ways. So, while we both agreed on the fact that we needed to talk (or rather write) about privilege, we wanted to find ways to present multiple facets and sides to the concept and how it manifests itself in India. Another interesting moment was recognizing that the reason India as a culture can be complex to understand is because it has so many shades of grey. For example, communication can be direct yet indirect depending on the situation. So what could we tell our participants/readers about the communication style in India? Therein was born our new, cool (even if we say so ourselves!) table that makes distinctions among the ways in which different values are manifested across urban or rural environments, generations, in multinational corporations and domestic business. The objective of this table is to help the reader understand how the same value can be demonstrated in different—and sometimes even opposite—ways. We hope that the underlying message that is the integral CD message: always analyse the context of any situation while trying to understand or decode it. The newly revised CD India package builds on the previous version and is updated based on current social, economic, political and business contexts. It has a lot more practical and hands-on tips and best practices for those who are living and working in India, because that’s what we as authors look for when we take off to another country. We’ve ensured that there are elements that speak to what this information means to you if you’re working and/or doing business in India. It’s been written with a lot of care (we’ve tried to stay away from declaratives), excitement (we’re getting to shape how the country is perceived!) and thought (we discarded version after version until we were satisfied with it)! Come and take the journey to India through our new Cultural Detective India package, now available in CD Online as well as via printed PDF, and explore its vastness, complexity and uniqueness! Happy travels! The summer has gotten off to a running start, that is for sure! If you’ve been wanting to get certified in Cultural Detective, to transform how you work in this world to develop intercultural competence in yourself and others, get online and register now! This approach looks at people as complex individuals with unique personalities, influenced by multiple layers of culture. Cultural Detective is practical, theoretically sound, developmentally appropriate, and immediately useful. Tatyana Fertelmeyster will be conducting a two-day workshop between sessions at SIIC, the Summer Institute for Intercultural Communication, on Thursday and Friday the 26th and 27th of July. Click here for more information, and click here to register. This is the only public certification on our calendar at this time. Why Travel Matters: A guide to the life-changing effects of travel, by Craig Storti, published by Nicholas Brealey, 2018. Are you looking for a terrific graduation gift? Just published last week, this quick, thought-provoking read will encourage any beloved young adult in your life to challenge themselves to develop new perspectives and values by experiencing the world around them fully. myself, I believe I have changed to the very marrow of my bones. The book is written in typical Craig Storti style: engaging prose, good humor, content based on sound concepts and theory, well explained with lots of stories and examples. I read it on one leg of my flight last week and have already purchased several copies for the graduates on my gift list. Not a typical travel book, Storti talks to the reader about the consequences of the trip rather than the trip itself, the inner as well as the outer journey, using quotations, insights, reflections and commentary from travelers, travel writers, historians and literary masters including Mark Twain, DH Lawrence, Aldous Huxley, St. Augustine and Somerset Maugham. He reviews the history of travel, including the importance of the grand tour beginning in 16th century Europe. He goes on to explain the rise of modern tourism in the 1840s, thanks to Thomas Cook injecting the four elements of speed, comfort, convenience and tour groups, scrubbing travel of experiences that might disturb or discomfort—and, thus, removing its transformative powers. For me, with a passion for travel, who has hired a tour guide but has yet to take a group tour, who lacks the patience to lead a group of tourists, and who values a liberal arts education heavily grounded in study abroad and cross-cultural competence, the message this book promotes is music to my ears. and had come to different conclusions. Storti defines tourism as escape, recreational travel during which tourists are served by locals. Tourism is relaxing; tourists see the sights. Travel, on the other hand, is arriving at a destination. Travel is educational, travelers meet with locals and are stimulated to understand. and tourists don’t know where they’ve been. Storti weaves in recent discoveries in neuroscience and recounts powerful passages from some of the world’s greatest travel narratives to support his thesis, including the story from Saint-Exupery’s Wind, Sand and Stars of the first time the Moors realized the Sahara was a desert and so very dry compared to other parts of the world—after they’d travelled and seen their first waterfall (p. 35). The reader thus learns that impressions formed abroad change how we see home once we return. He presents and reframes basic intercultural concepts in the context of travel: “You don’t see what is in front of you; you see your brain’s perception of it” (p. 24), sharing with us how JG Farrell saw blood spatters on the pavement during his journey through India, when in reality the red he was seeing was betel juice (Indian Diary), or Storti’s own inability to identify what his eyes were seeing when he first glimpsed icebergs from the air. the more we have seen, the more we are subsequently able to see. Knowledge of ourselves—what we at Cultural Detective call “subjective culture,” meaning knowledge of ourselves as unique individuals influenced by multiple layers of culture—gives us choice over who and how we are in this world. One’s destination is never a place but a new way of seeing things. Stay out of touch/off the grid; you can’t have an experience and share it at the same time, attempts at the latter diminish the former. Secure an introduction, a friend of a friend or colleague, to provide you a look inside the life of a local resident. Frequent places where you’ll find locals. Read about the country before and during your travel. Why Travel Matters includes three appendices: an interesting collection of rules for travel from other authors; a selection of quotes from people who are against travel, which feels a bit out of place or forced; and a wonderful list of the world’s great travel books—several of which I’m confident you’ll want to add to your reading list. Here’s to enjoying and benefitting from the journey! with the whole living self. Proverbs are platitudes until you have experienced the truth of them. We Want to Get Rid of You! Many thanks to Joanna Sell, a certified Cultural Detective facilitator, for this terrific guest blog post. Be sure to check out her new intercultural storytelling blog at http://www.interculturalcompass.com/blog/. It was early autumn when Martin, a German project leader, relocated to Mexico. At the beginning of his assignment he was very excited about the new challenge and curious about the host culture. His only concern was the fact that he was an introvert. Every day before going to his company he threw a coin and “played heads or tails”. When he saw heads he would talk to the very first employee he encountered on his way. While seeing tails he would breath a sigh of relief that he did not have to “jump over his shadow” to practice small talk. Nobody knew about his habit and his team members were quite puzzled by his behavior, seeing that he did not talk to them as often as had their former leaders. Pretty soon even those who had been very talkative at the beginning of Martin’s assignment limited their exchanges with him to the minimum. His assignment became challenging and Martin could not help feeling excluded, not only in the professional context but also in private life. Actually, he almost had no private life at all. Spending extra hours at work in the evening and during weekends resulted in isolation amidst a crowd of smiling faces in Mexico. One late October morning, shortly after arriving at the office, Martin noticed a colorful skull made of sugar on top of his desk. He closed the door and slowly sat down. He remained frozen for half an hour or longer. He noticed that his colleagues barely spoke to him. Seeing the skull, he got terrified that they most probably wanted to get rid of him. When Katrin Sihling—a dear colleague of mine from the Munich area who was raised by her Mexican mom and her German dad in South Germany—finished the story and asked that question, everyone in our group at Jena University smiled. Someone hurried with a possible explanation: “People in Mexico celebrate November 1st with parties to commemorate their ancestors and give one another sweet skulls to highlight the festive character of this feast”. Listening to that explanation I sketched the following concluding scene in my head: Luckily, Elena, one of Martin’s team members, originally from Switzerland, entered his office and got concerned when she saw Martin’s pale face and absent gaze. When he indicated towards the skull without saying a word, she immediately noticed the cultural misunderstanding. It was she who had put the colorful sugar skull on his desk, as she did every year for all the people in their department. She explained the symbolic meaning of the sweet skull and asked Martin whether he wished to join the Mexican part of her family in celebrating El Dia de los Muertos. That day both of them learned something new: not to take the world of obviousness (their world of obviousness) for granted, but to ask for new meanings instead. The power of the storytelling approach in the intercultural context lies exactly in this attitude. Exchanging stories across cultures enhances curiosity and redirects attention from a focus on general, simplified assumptions and towards sense making and re-narrating the world of obviousness; that’s why the Cultural Detective Method is built around stories! Every critical incident in our series is a true story, sometimes a combination, involving real people in real situations. “Culture is a set of stories that we enter” (Jerome Brunner) and exchanging facts and data about cultures without exchanging stories is a dead-end street. “It is the stories we share with each other that help us to overcome cultural conflicts, cope with transition stress, and shape how we perceive the past and see the future. Thanks to an exchange of stories we become able to rethink our assumptions and change our behavior. Changing behaviors definitely requires mindfulness in order to recognize which behaviors are inappropriate and which are desirable in different cultural contexts. Storytelling suppports zooming in and out effects and, therefore, enables perspective change. Storytelling allows the discovery of cultural roots from multiple perspectives. Storytelling offers insights into the complexity of multicultural identities. Storytelling can be an eye-opener in new cultural surroundings. Storytelling serves as a means of transmitting cultures. Sell, J. (2017): Storytelling for Intercultural Understanding and Intercultural Sensitivity Development in: Chlopczyk, J. (ed.) Beyond Storytelling. Springer Gabler, pp.234-235. Sell, J. (2017): Storytelling for Intercultural Understanding and Intercultural Sensitivity Development in: Chlopczyk, J. (ed.) Beyond Storytelling. Springer Gabler. Sell, J. (2017): Segel hoch und auf zu neuen Ufern – Eine Reise durch die Welt der Storytelling-Methoden im unterkulturellen Kontext in: Schach, A. (ed.) Storytelling. Geschichten in Text, Bild und Film, Springer Gabler. 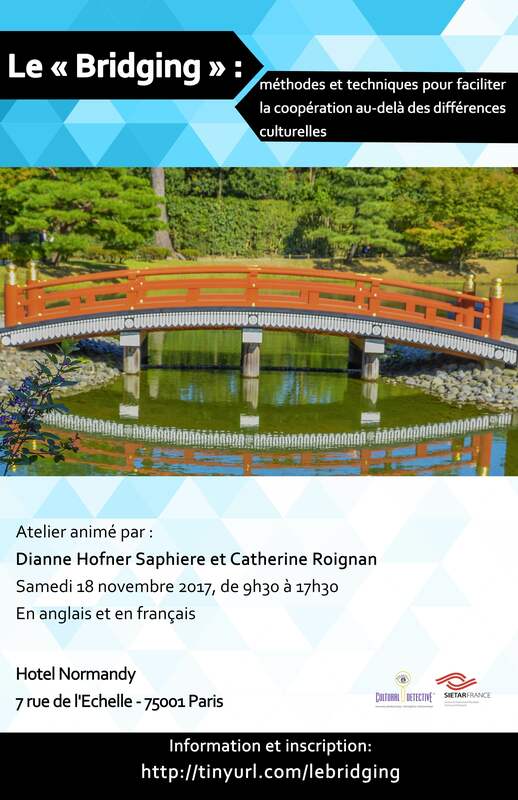 I hope you’ll join Catherine Roignan and myself in the heart of Paris on 18 November for this terrific one-day, bilingual workshop! English follows the French. Savoir « créer des ponts » entre personnes ou groupes culturellement différents, les mettre en situation et en capacité de communiquer et coopérer de façon efficace : c’est à la fois une nécessité et un but pour de nombreux chefs d’équipe, que ce soit en entreprise, dans les administrations ou les ONG. Le « bridging » est aussi l’objectif ultime du travail interculturel : si on apprend à remettre sa propre culture en perspective et à se familiariser avec la culture de l’autre, c’est précisément pour parvenir à construire ce pont sur lequel se rencontrer. Mais comment s’y prend-on concrètement? Comment les managers et les professionnels de la formation et du conseil peuvent-ils favoriser la synergie des efforts et des équipes internationales? Le Cultural Detective® « Bridging Cultures » capitalise sur l’expertise existant désormais dans ce domaine : compétences, activités, grilles d’analyse, bonnes pratiques pour faire évoluer les esprits et les pratiques, issues d’expériences dans différentes organisations dans le monde. Identifier des mesures concrètes permettant de faciliter la coopération entre groupes culturellement divers. Vous serez amenés à expérimenter vous-mêmes plusieurs exercices du Cultural Detective® « Faire le pont entre les cultures », de manière à pouvoir ensuite les transposer dans vos groupes et organisations. L’atelier sera bilingue, en français et en anglais. 17h15 Conclusion, retours des participants et pistes pour action. To build a bridge between culturally diverse persons or groups and develop the environment and ability to communicate and cooperate efficiently: that’s both a necessity and a goal of many team leaders in organizations worldwide. Bridging is also the ultimate goal of any intercultural work: learning to put our own culture in perspective and learn about the other’s cultures is part of the process. But how to do this concretely? And how can managers and training and consultancy professionals best support the synergy of efforts and teams, so that differences become assets ? Cultural Detective Bridging Cultures capitalizes on the now-existing expertise of intercultural bridging practices in different organisations around the world. It identifies key competencies, offers activities, grids for analysis and best practices to help mindsets and habits evolve and to create cooperation. Reinforce your personal ability to communicate and bridge with different people. Prevent and overcome blocking situations. Adapt your bridging strategy to specific contexts. Explore different techniques to foster cooperation between culturally different groups. This workshop will leverage select exercises from Cultural Detective® Bridging Cultures so that you can replicate them in your work, communities and organizations. You will leave the workshop with practices you can implement immediately as well as extensive handouts. The workshop will be facilitated bilingually in French and English. Early Bird Rate Closing Soon! You have two more chances in 2017 to become certified in the use of Cultural Detective. The early-bird rate for the certification in San Diego ends 30th September! Post-conference workshop of the SIETAR USA Conference. Profits benefit SIETAR USA. Sponsored by and with profits benefitting SIETAR Austria, this is a lower price than normal, so take advantage! We very much look forward to having you join us and to helping us develop intercultural competence for enhanced respect, understanding, collaboration and justice in this world!